The City is committed to creating a safe and accessible pedestrian and cycling network for people of all ages and abilities. Over the last few years, road renewal, improved streetscaping and new bike lanes were implemented throughout Downtown and the Exchange District. With redevelopment planned for the Market Lands and other developments along Princess Street between William Avenue and Higgins Avenue, there is interest in increasing mobility choices, as more people move to and through the area. The Princess Protected Bike Lane project will carry out cycling, pedestrian and vehicular needs assessment studies. 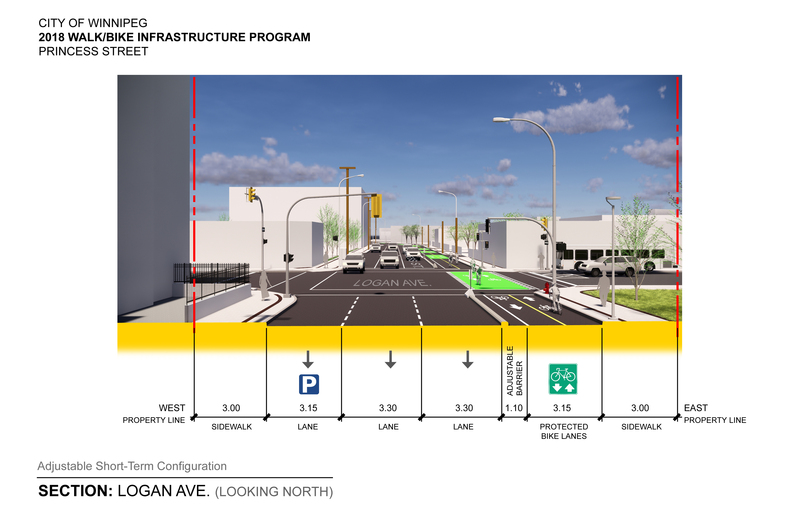 These include area stakeholder engagement, to develop recommendations for the City to complete the Princess Street protected bike connections from William Avenue to Higgins Avenue. Impacts and opportunities related to on-street parking will also be considered. 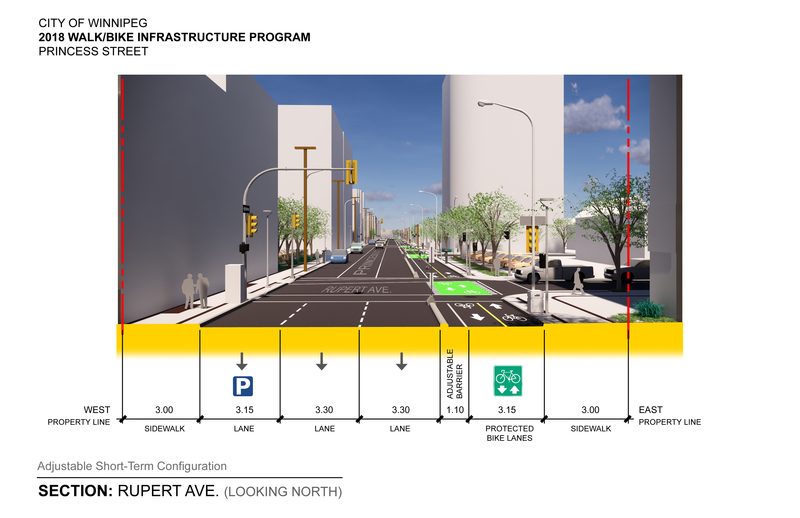 We have developed a proposed preliminary design of a protected bike lane, based on previous stakeholder feedback, that will further connect North Winnipeg and the west Exchange District with the rest of the Downtown network and Assiniboine Avenue bike lanes, closing gaps in the Downtown network. Update – Winter/Spring 2019: We are in the process of refining and finalizing our preliminary design and will be submitting final recommendations to City Council later this year. Stay tuned for more information. 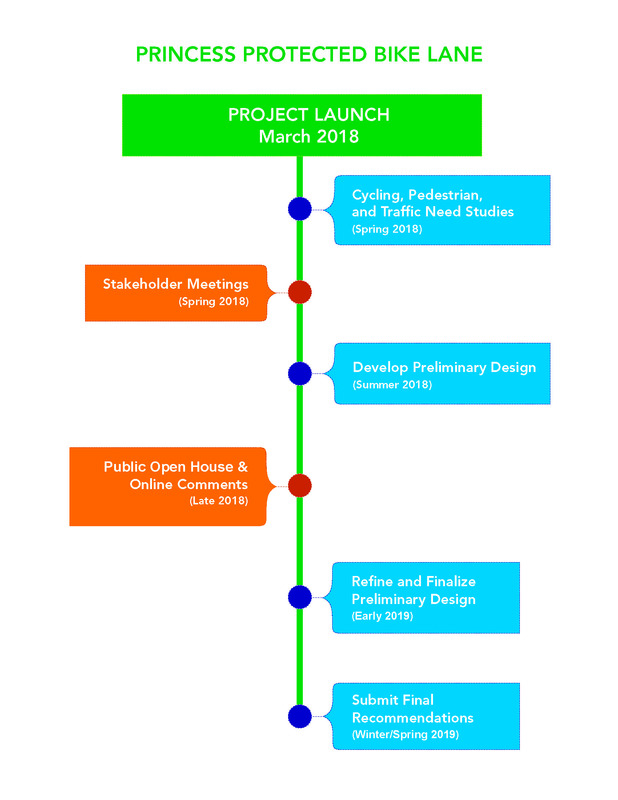 March 2019 – A public engagement report outlining feedback and how it was considered in the project design is now available under the documents tab. The proposed preliminary design will be considered in the update and review of the Pedestrian and Cycling Strategies, future Pedestrian and Cycling Action Plan, and as the roads and other pedestrian and cycling infrastructure are planned for renewal or repair in the study area. The proposed preliminary design was developed with consideration of vehicular, pedestrian and cycling needs and connections. Other considerations were parking, emergency access, streetscaping requirements in the study area, and connections to new and existing facilities. 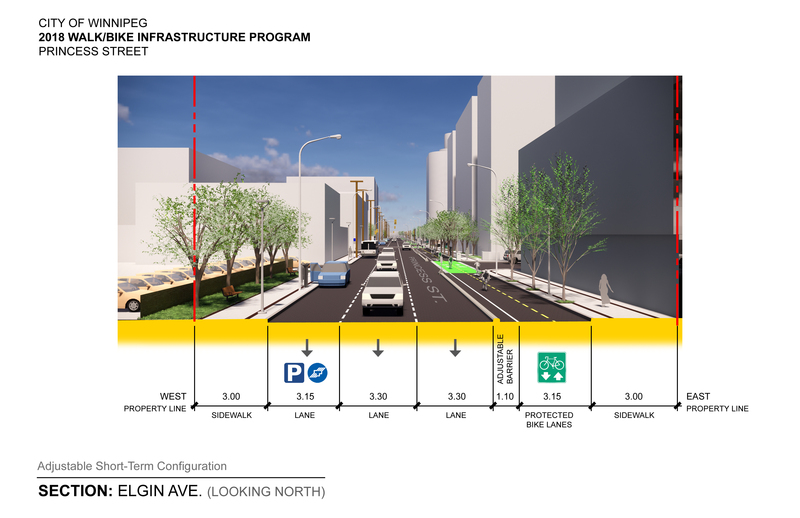 Based on this technical analysis and preliminary consultation with area stakeholders, the following illustrates the preliminary design proposed to enhance cycling and pedestrian connections, streetscaping and on-street parking and loading needs on Princess Street between William Avenue and Higgins Avenue. The preliminary design includes two-	way protected adjustable bike lanes along the east side of Princess Street. The project will allow for connection to new and existing bike lanes, including the Downtown Streets network along Garry Street with connections to the Exchange District on Notre Dame Avenue, Princess Street, and Arthur Street, and new bike corridors on both McDermot Avenue and Bannatyne Avenue between Waterfront Drive and Furby Street. 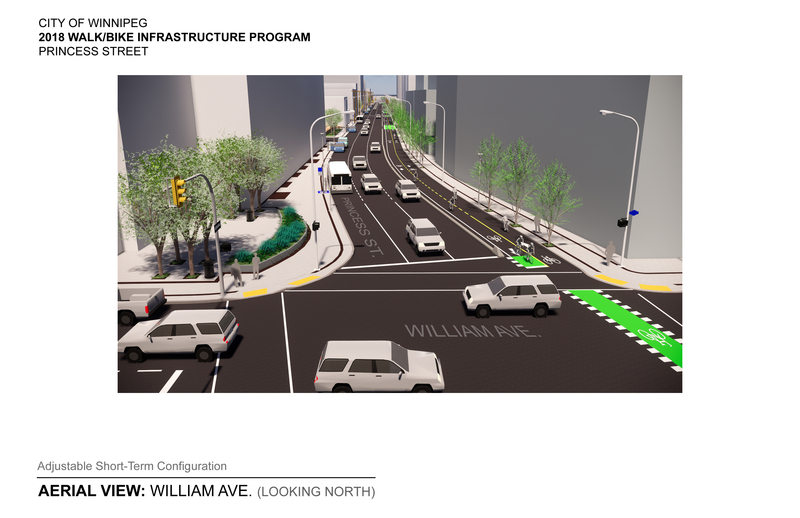 A bi-directional bike lane along the east side of Princess Street between William Avenue and Higgins Avenue is proposed. This will allow for north/south travel along this section of Princess and will connect into existing bike lanes. The initial concept on Princess Street proposes adjustable barriers will be installed to protect the bike lane with the intent to build permanent barriers once this section of Princess Street is renewed. significant impacts to street parking between William Avenue and James Avenue. Further details on different sections of the preliminary design are available under the Documents tab. The feedback period on this project is now closed. Input provided will ensure that community priorities and interests are reflected in the recommended design. A public engagement report outlining how input was used and considered is now available under the documents tab. Thank you to all who joined us at the information session on December 5, 2018. A total of 32 people attended the event at Red River College – Roblin Centre. Thank you to the 37 people who provided comment on the proposed enhancements through our online survey, which was available until December 19, 2018 . In May 2018, a preliminary consultation was held with frequent users of the area including representatives from Red River College, Siloam Mission, Chinatown Development Corporation and CentreVenture to garner input as to what issues and opportunities exist in the area. Key input provided included the need to improve sidewalks and lighting to allow for safer and more accessible pedestrian access, the desire for a protected bike lane, secure bike parking and continued loading access and on-street parking availability. In November 2011, City of Winnipeg Council approved the Transportation Master Plan (TMP). A key goal of the TMP is to expand the range of travel options that are available to residents, workers, and visitors, as well as to ensure that people are not dependent on one single mode of transportation. The TMP also called for the development of the Pedestrian and Cycling Strategies. This project reflects the long-term policy framework set out in Winnipeg's Pedestrian and Cycling Strategies, which were approved by Council in 2015. These strategies serve as a roadmap for civic investments into infrastructure and active transportation support programs in order to make walking and cycling safer, more convenient, accessible, and attractive to citizens. Improving the range of travel options available to Winnipeggers, including options that promote active transportation and healthy living, was a key goal of the 2011 Transportation Master Plan. In 2018, a parking protected bike lane was built on Princess Street from Notre Dame Avenue to William Avenue and will connect to this project. How will this project maintain and enhance safety? Separating all road users presents the safest way to accommodate all modes of transportation. Enhanced street crossings will be considered along with creating space for streetscape improvements including bike parking, lighting, trees, and street furniture. The City is committed to creating a pedestrian and cycling network that is safe and accessible for people of all ages and abilities. Will the bike lane connect with existing cycling routes? Yes. 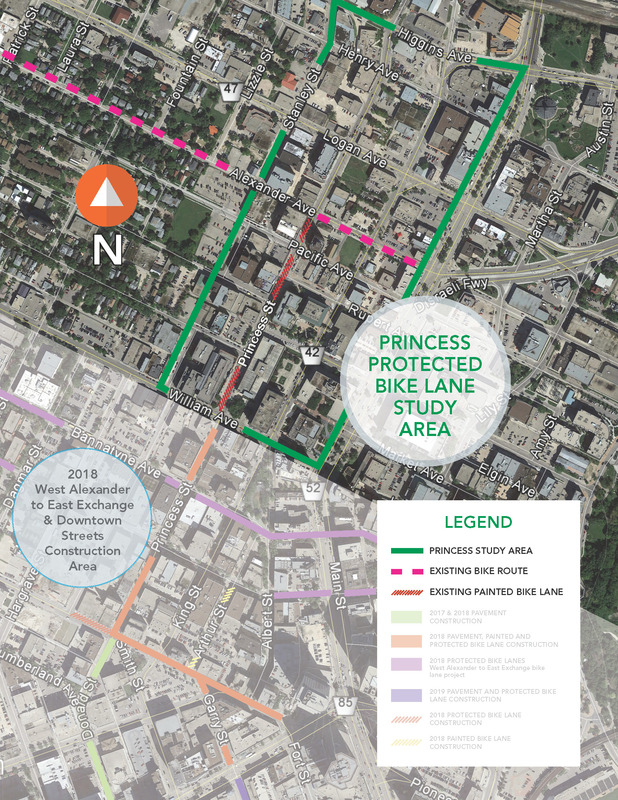 When complete, the upgraded cycling lane along Princess Street will intersect with the Downtown Streets network, which leads to the Assiniboine Avenue bike lane and beyond, providing a seamless link through downtown. It will also connect to the West Alexander to East Exchange Corridor that will be constructed in summer 2018, which will extend from Waterfront Drive all the way to Arlington Street through the West Alexander Corridor. If Princess Street is one-way southbound for motorists how can I ride my bike northbound? The study team recognizes this and will be looking at options for accommodating cyclists using protected infrastructure northwards along Princess Street or King Street. Will there be a loss of on-street parking and loading zone spaces? The design will maintain as much on-street parking and loading as possible. The City understands that parking and loading zones are important to businesses and residents. We are in the process of consulting local businesses and other area stakeholders to ensure that improved bike lane balances the needs of area businesses. To view a map of the proposed changes, visit the Preliminary Design tab. How will the location of bike parking be decided? The City will work with area stakeholders to determine specific locations with a high demand for bike parking. What is the Downtown Streets project? What is the West Alexander to East Exchange Corridor project? 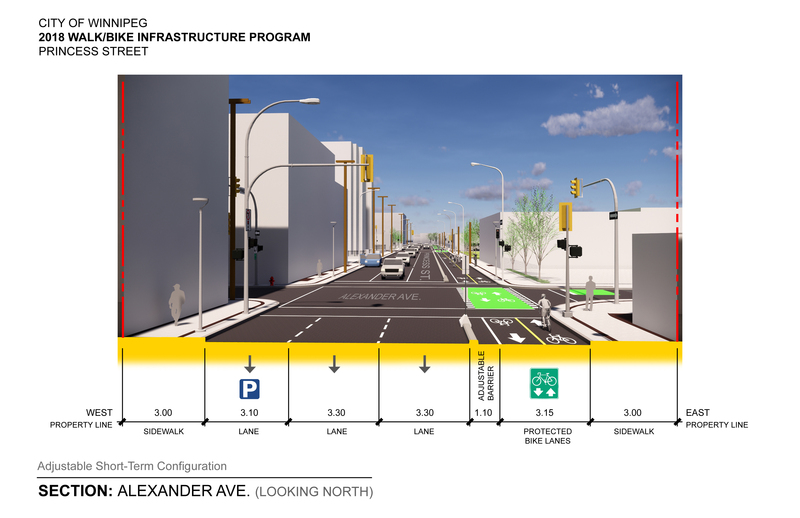 The West Alexander to East Exchange Corridor project includes the construction of one-way protected bike lanes on both McDermot Avenue and Bannatyne Avenue between Waterfront Drive and Furby Street. What are the City of Winnipeg's Pedestrian and Cycling Strategies? When will this project be built? The first step is to complete the study, which will provide an estimate for future budget considerations. How has stakeholder feedback been used in the design so far? In May 2018, a preliminary consultation was held with frequent users of the area including representatives from Red River College, Siloam Mission, Chinatown Development Corporation and CentreVenture to garner input as to what issues and opportunities exist in the area. Key input provided included the need to improve sidewalks and lighting to allow for safer and more accessible pedestrian access, the desire for a protected bike lane, secure bike parking and continued loading access and on-street parking availability. This feedback was considered and incorporated in the proposed preliminary design. What is an adjustable bike lane? Rather than constructing a permanent curb into the road (as with the Assiniboine Avenue bike lane), the adjustable curb is anchored to the road surface using steel pins. Hence, this method does not require a complete road renewal to implement as with permanent lanes and offers more flexibility in terms of placement. Adjustable bike lanes can be more cost effective and a faster way to create a protected bike lane. To find out how you can get involved, please visit the Engage tab.